Join us for family friendly hands-on science with Science@Cal, Solar viewing with UC Berkeley Astronomy and learn to build a drone with UAVs @ Berkeley at the Family Fun Festival! 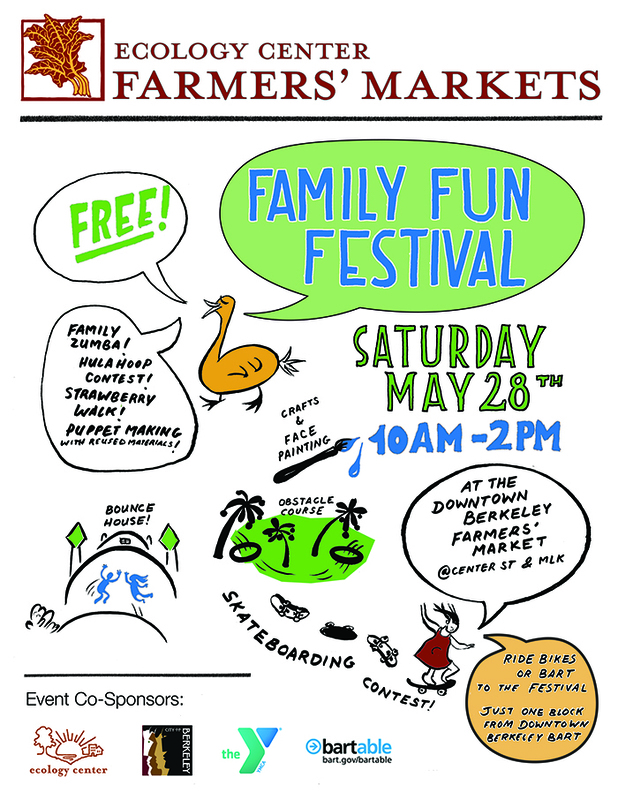 The annual FREE Family Fun Festival is back this year on Saturday, May 28th at the Downtown Berkeley Farmers’ Market from 10am-2pm! Once again the event is co-sponsored by the Ecology Center, YMCA, the City of Berkeley, and BART and will feature games, contests, performances, and hands-on activities for all ages! Highlights include a farm animal petting zoo, bounce houses, obstacle courses, face-painting, puppet-making, and collaborations with the Berkeley Public Library, Science@Cal, artist Zach Pine, and East Bay Depot for Creative Reuse. For the older kids in your family, the City of Berkeley will host a skateboard contest beginning at 11am.